Jamaican sprint stars Usain Bolt and Shelly-Ann Fraser Pryce have been once again nominated for top sports honours. This time they are both nominated for the Laureus Sports Man and Woman of the Year Awards. In a post on Facebook, Fraser Pryce expressed appreciation at being nominated for the prestigious award. In honor of Black History Month, Black Enterprise is highlighting past pioneers and current day historymakers of color. Today, we are reflecting on two iconic sports influencers: LA Lakers. Considered one of the greatest to ever play the game, Wilt Chamberlain remains the only player in NBA history to average at least 30 points and 20 rebounds per game in one season. In addition to earning a multitude of awards and titles, such as NBA All-Star (13 times), All-Time Top Rebounder, Scoring Champion, Assists Leader and many more, “Goliath” was also responsible for changing the game. His professional career began when he joined the Harlem Globetrotters in 1958, with whom he played for one year, selling out tours and breaking records, which led to the team to retire his number, 13, in 2000. Chamberlain made his big debut in the NBA when he was drafted by the Philadelphia Warriors in 1959, breaking eight records during his first season. He later went on to play for the 76ers in 1965 for three years, where he continued to dominate the court, dropping an NBA-record by scoring a whopping 100 points in 1962 against the New York Knicks. In 1968, Chamberlain joined a Hall-of-Fame squad with the LA Lakers. He went on to finish his NBA career playing for the Lakers, with the last play of his career being a dunk with one second left, against the New York Knicks in 1973. His contributions in basketball are directly reflected in the fact that he was responsible for several rule changes, such as instituting offensive goal-tending and revising rules governing an inbound pass and shooting free throws. Chamberlain will always be regarded as a basketball legend and black hero. Today, another Laker rules the court. Kobe Bryant has won five NBA championships with the Los Angeles Lakers. After surpassing Michael Jordan on the NBA all-time scoring list, for third place in 2014, Bryant announced that the 2015-2016 season would be his last. 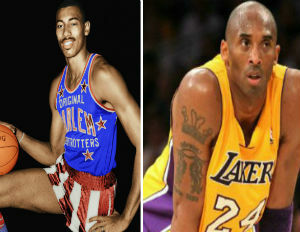 Like Chamberlain, Bryant was the recipient of many awards, including becoming the youngest All-Star (at just 19-years-old) in NBA history, Most Valuable Player, and many others. Bryant also played in both the 2008 and 2012 U.S. Olympic teams, where he won back-to-back gold medals with teammates Kevin Durant, LeBron James, and Carmelo Anthony. Bryant was the next closest to score anywhere near Chamberlain’s record 100-point game, when he totaled a high of 81 points in one game in 2006. Both Chamberlain and Bryant were leaders in NBA history, and should be recognized as important figures in black history during this month.